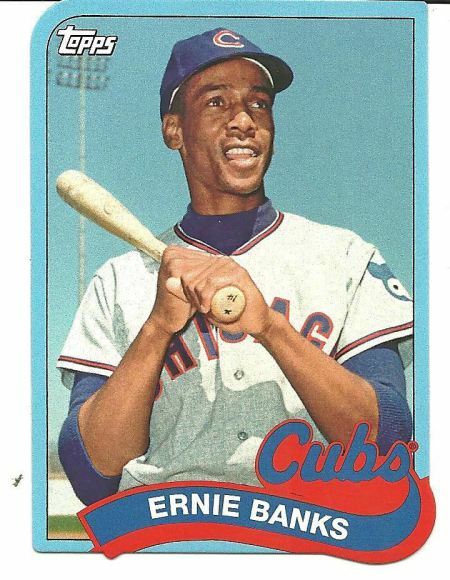 One year ago, I posted a card of Cubs legend Ernie Banks in anticipation of another great baseball season. I got up the next day and tuned in to watch the Opening Day of 2014. Then something weird happened to me. I asked myself a question that had never occured to me before: Why do I care so much about this? I had been a baseball fanatic for 25 years, watched games, read books, collected cards and discussed the game with everyone I met. But for whatever reason, on that day, it occured to me that I had wasted far too much time on something that did not matter. So I gave up on baseball. I didn’t buy cards. I didn’t watch MLB network or MLB highlights. I didn’t watch games on TV. I didn’t even follow the headlines. I watched the home run derby, All Star game one playoff game and game seven of the World Series on TV and was rather bored with them. I also went to two games in person because I had a friend in town. That’s it. After the inital shock of giving up baseball set in I had another question: What am I going to do? I decided to try to write a book. I always wanted to write a book, but I did not have the mental focus to keep it going. This time, I decided to try writing a football book, and managed in eleven months to go from an idea to a 150 page manuscript. That was huge for me. About a month ago, depression hit me so hard, I was even willing to give up the book I had worked so hard on. Then I went to a conference in my hometown. It was a Christian conference and while I grew up going to church, it was never real to me. That week I realized that God was more real than anything and dedicated my life to be his ambassador. Now that I have peace and joy in my life, I can now finish my book as well as other projects I have been working on. I don’t know if or when I will get back to blogging or baseball. If I do, it will not have the same priority as before. I pray for peace and joy for all of you reading this. We got the setting, sunshine, fresh air. We got the team behind us, so lets play (one hundred sixty) two!! HAPPY OPENING DAY TO ALL!! Here is another classic commercial, remember kids, its important to read the price guide correctly! I was 11 that year and do not remember this. If you had this, can you tell me about this? This is a sell sheet for a new product. 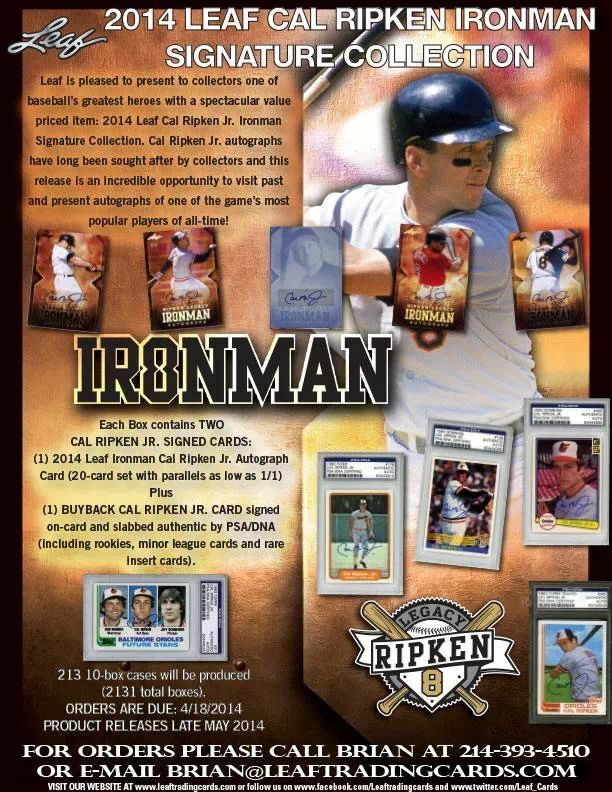 Each pack consists of two Cal Ripken autographed cards. As much of a Ripken fan as I am, I don’t need two autographed cards of him, especially in a pack that I know about. Does anyone else find this strange? I have been quite busy and broke, so no new cards for me, however Chris Olds from Beckett opened two boxes of old minor league cards, finding stars and trainers. It is a fun view. If you are my age, it is quite lolworthy. This video, courtesy of YouTube, is of a guy opening a pack of 1966 Philadelphia. He pulls THE big card of the set in the pack. Have you ever pulled the biggest card in the pack? What did you get? This classic commercial made me smile. This is one of the coolest collections I have ever seen on YouTube. According to Yahoo, Jayson “Unfrozen Caveman” Werth is not too happy with the image on his 2014 Topps baseball card. I am kinda surprised athletes even notice their cards in this day and age. Have you seen any articles about athletes discussing their own cards like this?